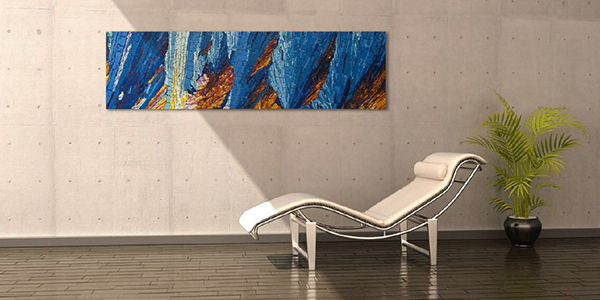 When it comes to choosing artworks to be combined with the furniture in your home, you have the same problem–if not worse. Because if you wear the wrong coat, all you need to do is go back home and get another one; but if you fail the combination of colours in the decoration of your home, you’ve got to keep it the way it is (or spend more money to change). So let’s see the five secrets you need to know to make the right choice of colours, so that you don’t have to give up an aesthetic experience for fear of going wrong. The first rule you must comply with, is: the intended use of the room must determine the choice of colours. Where you intend to relax – bedroom, jacuzzi-bathroom – you want to have relaxing colours, such as tones of green, sky-blue, pastel colours. In other places you may want more stimulating colours such as full red, or orange, colours which elsewhere might be dangerous. 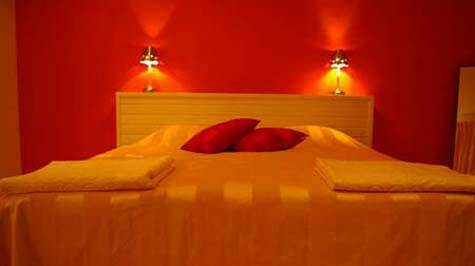 For instance, red walls tend to awaken, which is appropriate in a shower, much less in a bedroom. Remembering your mother’s scoldings, you will avoid wearing a red coat on orange trousers. However, in some instances combining stimulating colours is appropriate, even desirable. There is a tool which is well known to artists, called the “colour wheel”. It is a circle-shaped scheme, on which different tones of colours are placed according to criteria which help understand combinations. Isaac Newton invented it in 1666. The wheel distinguishes between primary colours – red, yellow, blue – secondary – orange, green, violet – and tertiary or intermediate. 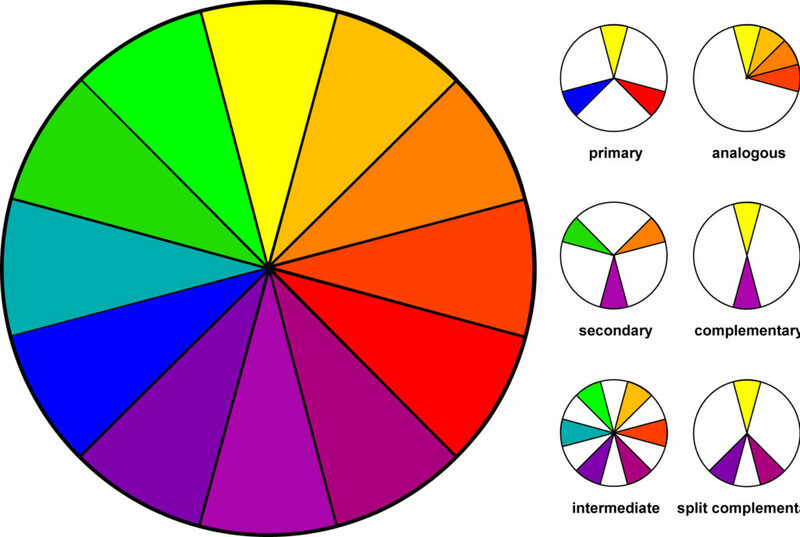 The colour wheel, which is being commonly used even in computer graphics programmes, is a good aid in selecting colours, at least to have a first idea of what criteria are to be used in the choice of colours. Enter a second factor, namely psychology. Each colour has a specific effect on our mind, as we discussed in the previous point where we mentioned the association of colours and environment. Schemes based on one single colour can be very sophisticated, and produce particular effects. Following you will find a few examples of colour combinations, with different effects. 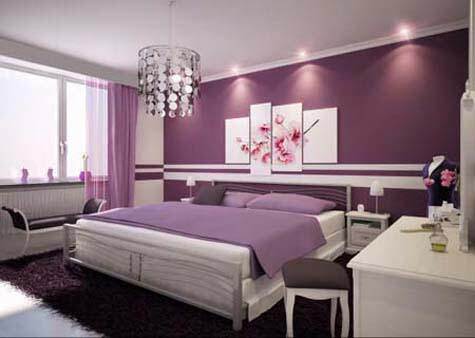 Monochromatic.A lavender-colour bedroom is a fine example of combining objects in the same colour. The hue of lavender may differ from one object to another, but the result gives a feeling of wrapped-up and safe. Disturbing. A red-only bedroom feels anything but relaxing. Analogous colours give a lively effect, which looks good, for instance, in a young couple’s bedroom. 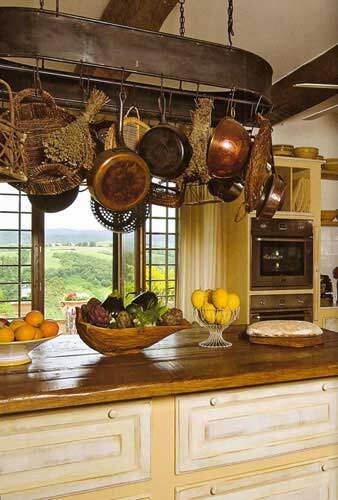 In the kitchen there are further opportunities for combining colours, for instance in this case the monochromatic effect of the wood-coloured furniture and the copper-coloured pans. As a rule, light colours give a feeling of wider space, whereas intense colours tend to impose their presence. In a low-ceilinged room you will want to paint the ceiling white or light yellow, the latter being more luminous. A small room wants light colours, which “open up”. Where ceilings are tall and the space is wide, you have no problem in colouring walls sienna-red or emerald green (as long as you comply with the other rules we are discussing). Dense colours, which tend to reshape and reduce the space. Once you have decided the colour combination, you may choose to add a touch of strongly contrasting colour, or maybe a metallic tone – silver, gold – which focuses the attention of the eye. If carefully planned, the effect can be very pleasant. But take care not to overdo, or you may risk bad taste. For instance, look at the effect of our «β-e» in an environment dominated by white, steel and light grey. 5- Don’t be afraid of colour! Try putting a box of coloured crayons in the hands of a child: he will instinctively choose the most lively colours. 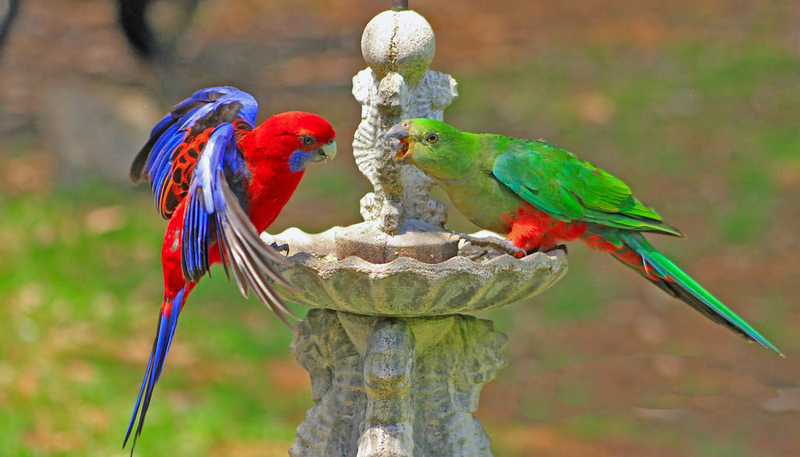 Look at what nature does: it boldly gave these birds violent colours. 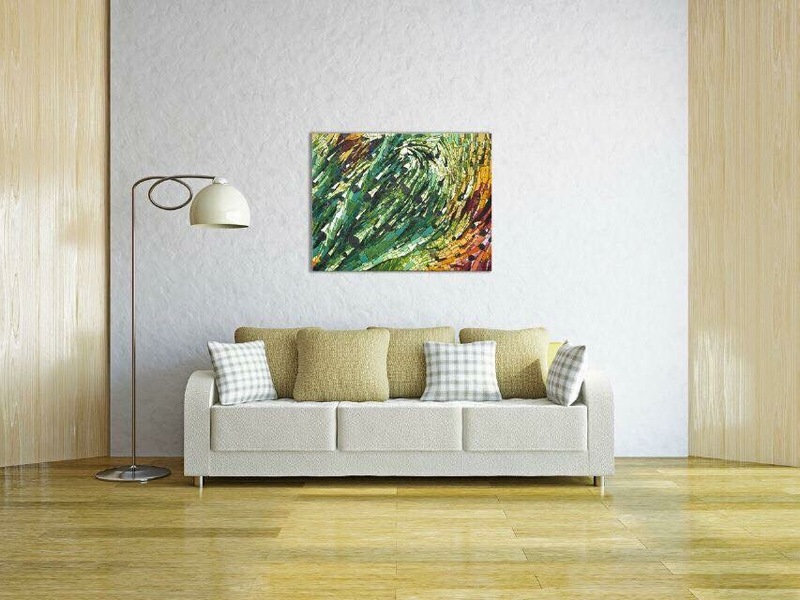 How many of us would choose the colours of this bird’s feathers for our dining room? Of course we do not need to overdo. We may, better still we must be careful, and follow the criteria of good taste for a pleasing result. But on the other hand we mustn’t be scared to the point of forcing us to black and white only. There is no reason to do so. The world outside is in colours; colour is life, joy, energy, and a colourless home smothers enthusiasm and liveliness off.